Mindful of the fact that most of the posts on this blog are provoked by media coverage that works to further mystify AI/robotics, I thought I would break with that pattern to recognize a recent story that, to my reading, breaks with the pattern. A piece by Andrew J. Hawkins in The Verge reviews the state of robot taxis in Phoenix, Arizona. Having been assured on several occasions by tech-savvy friends that self-driving cars are in everyday operation in Phoenix, this story helps to clarify the actual state of the technology. And Hawkins raises some welcome questions as well about the claimed benefits of autonomous vehicles; questions that should be at the forefront of discussion about public investment in transportation infrastructures going forward. While it’s not until paragraph nine that we discover that the autonomous vehicles deployed in the Waymo One taxi service actually still include a human ‘safety driver,’ there’s much to learn here. The piece is headlined by a video report from Hawkins on his own experience of the service. Hawkins points out that Alphabet/Google’s Waymo is the longest running and most extensive of the autonomous vehicle projects, with the lowest number of recorded “disengagements,” or events in which the human driver has to take over the wheel. The current trial is limited to four towns in the greater Phoenix area, and to voluntary members of Waymo’s “early rider” program (with requisite non-disclosure agreements and, we might assume, liability waivers.) We might note in the aerial views of the designated areas the Arizona landscape’s flatness, and of course we know that the reason for the old prescription to “ship your sinuses to Arizona” (familiar at least to TV watchers of my generation) is that state’s relatively rain free climate. There’s not much discussion of Arizona’s particularities here or in the media more generally, but they point us towards the question of what environmental conditions are required for the self-driving car’s successful operation. Perhaps the most welcome moment in Hawkin’s account comes when he turns to the question of whether the car is actually the most imaginative, or even desirable, vehicle for the future of transportation. Millennials, he reports, indicate in poll data some doubt about the future of car travel, and a preference for better public transportation, along with safer spaces in which to bike and walk. While touted as a remedy to the proven fallibility of human drivers, comparable safety statistics for the driverless car aren’t really available, according to Sean Sweat of the Urban Phoenix Project, given the relative size of data sets on cars driven by humans and driverless cars over time. Sweat points out that the question of driver safety also sidesteps the question of how the design of urban spaces, particularly streets, might contribute to pedestrian fatalities or, alternatively, to their avoidance. This points to the much larger issue of how the investment in a future of self-driving cars might drive the reconfiguration of transport infrastructures required to enable them. Not only the cars themselves, but our roadways and urban landscapes will likely become further instrumented in the service of vehicle autonomy. This isn’t inherently a bad thing; the Copenhagen subway system, for example, has evolved through a thoroughgoing makeover of the city infrastructure to create a driverless and extremely safe transport system to accompany its bicycle-friendly streetscape (most obviously, there’s no open access to the track, even from the station platform). But in car cultures the financial expense required to re-engineer highways and cities in order to make them autonomous vehicle friendly is accompanied by lost opportunity costs, beginning with a sidelining of discussion about alternative possibilities. Meanwhile the future of autonomous cars that can drive any road, under any conditions, may take decades, Hawkins concludes, or may never happen. Far from inevitable, then, the driverless car is a project urgently in need of braking, to open a space for more innovative ways of thinking about safe and sustainable transport. On June 7th, Google CEO Sundar Pichai published a post on the company’s public blog site titled ‘AI at Google: our Principles.’ (Subsequently abbreviated to Our Principles.) The release of this statement was responsive in large measure to dissent from Google employees beginning early in the Fall of last year; while these debates are not addressed directly, their traces are evident in the subtext. The employee dissent focused on the company’s contracts with the US Department of Defense, particularly for work on its Algorithmic Warfare Cross Functional Team, also known as Project Maven. The controversy was receiving increasingly widespread attention in the press. It is to the credit of Google workers that they have the courage and commitment to express their concerns. And it is to Google management’s credit that, unusually among major US corporations, it both encourages dissent and feels compelled to respond. I was involved in organizing a letter from researchers in support of Googlers and other tech workers, and in that capacity was gratified to hear Google announce that it would not renew the Project Maven contract next year. (Disclosure: I think US militarism is a global problem, perpetrating unaccountable violence while further jeopardizing the safety of US citizens.) In this post I want to take a step away from that particular issue, however, to do a closer reading of the principles that Pichai has set out. In doing so, I want to acknowledge Google’s leadership in creating a public statement of its principles for the development of technologies; a move that is also quite unprecedented, as far as I’m aware, for private corporations. And I want to emphasize that the critique that I set out here is not aimed at Google uniquely, but rather is meant to highlight matters of concern across the tech industry, as well as within wider discourses of technology development. One question we might ask at the outset is why this statement of principles is framed in terms of AI, rather than software development more broadly. Pichai’s blog post opens with this sentence: “At its heart, AI is computer programming that learns and adapts.” Those who have been following this blog will be able to anticipate my problems with this statement, singularizing ‘AI’ as an agent with a ‘heart’ that engages in learning, and in that way contributing to its mystification. I would rephrase this along the lines of “AI is the cover term for a range of techniques for data analysis and processing, the relevant parameters of which can be adjusted according to either internally or externally generated feedback.” One could substitute “information technologies (IT)” or “software” for AI throughout the principles, moreover, and their sense would be the same. Pichai continues: “It [AI] can’t solve every problem, but its potential to improve our lives is profound.” While this is a familiar (and some would argue innocent enough) premise, it’s always worth asking several questions in response: What’s the evidentiary basis for AI’s “profound potential”? Whose lives, more specifically, stand to be improved? And what other avenues for the enhancement of human well being might the potential of AI be compared to, both in terms of efficacy and the number of persons positively affected? This promotional opening then segues to the preamble to the Principles, explaining that they are motivated by the recognition that “How AI is developed and used will have a significant impact on society for many years to come.” Readers familiar with the field of science and technology studies (STS) will know that the term ‘impact’ has been extensively critiqued within STS for its presupposition that technology is somehow outside of society to begin with. Like any technology, AI/IT does not originate elsewhere, like an asteroid, and then make contact. Rather, like Google, AI/IT is constituted from the start by relevant cultural, political, and economic imaginaries, investments, and interests. The challenge is to acknowledge the genealogies of technical systems and to take responsibility for ongoing, including critical, engagement with their consequences. The preamble then closes with this proviso: “We acknowledge that this area is dynamic and evolving, and we will approach our work with humility, a commitment to internal and external engagement, and a willingness to adapt our approach as we learn over time.” Notwithstanding my difficulties in thinking of a precedent for humility in the case of Google (or any of the other Big Five), this is a welcome statement, particularly in its commitment to continuing to listen both to employees and to relevant voices beyond the company. The principles themselves are framed as a set of objectives for the company’s AI applications, all of which are unarguable goods. These are: being socially beneficial, avoiding the creation or reinforcement of social bias, ensuring safety, providing accountability, protecting privacy, and upholding standards of scientific excellence. Taken together, Google’s technologies should “be available for uses that support these principles.” While there is much to commend here, some passages shouldn’t go by unremarked. The principle, “Be built and tested for safety” closes with this sentence: “In appropriate cases, we will test AI technologies in constrained environments and monitor their operation after deployment.” What does this imply for the cases where this is not “appropriate,” that is, what would justify putting AI technologies into use in unconstrained environments, where their operations are more consequential but harder to monitor? ­The principle “Be accountable to people,” states “We will design AI systems that provide appropriate opportunities for feedback, relevant explanations, and appeal. Our AI technologies will be subject to appropriate human direction and control.” This is a key objective but how, realistically, will this promise be implemented? As worded, it implicitly acknowledges a series of complex and unsolved problems: the increasing opacity of algorithmic operations, the absence of due process for those who are adversely affected, and the increasing threat that automation will translate into autonomy, in the sense of technologies that operate in ways that matter without provision for human judgment or accountability. Similarly, for privacy design, Google promises to “give opportunity for notice and consent, encourage architectures with privacy safeguards, and provide appropriate transparency and control over the use of data.” Again we know that these are precisely the areas that have been demonstrated to be highly problematic with more conventional techniques; when and how will those longstanding, and intensifying, problems be fully acknowledged and addressed? Technologies that cause or are likely to cause overall harm. Where there is a material risk of harm, we will proceed only where we believe that the benefits substantially outweigh the risks, and will incorporate appropriate safety constraints. What are the qualifiers “overall” doing here, or “material”? What will be the basis for the belief that “the benefits substantially outweigh the risks,” and who will adjudicate that? 2. Weapons or other technologies whose principal purpose or implementation is to cause or directly facilitate injury to people. As the Project Maven example illustrates, the line between a weapon and a weapon system can be a tricky one to draw. Again from STS we know that technologies are not discrete entities; their purposes and implementations need to be assessed in the context of the more extended sociotechnical systems of which they’re part. Technologies that gather or use information for surveillance violating internationally accepted norms. Technologies whose purpose contravenes widely accepted principles of international law and human rights. Again, these commitments are laudable; however we know that the normative and legal frameworks governing surveillance and human rights are highly contested and frequently violated. This means that adherence to these principles will require working with relevant NGOs (for example, the International Committee of the Red Cross, Human Rights Watch), continuing to monitor the application of Google’s technologies, and welcoming challenges based on evidence for uses that violate the principles. A coda to this list ensures Google’s commitment to work with “governments and the military in many other areas,” under the pretense that this can be restricted to operations that “keep [LS: read US] service members and civilians safe.” This odd pairing of governments, in the plural, and the military singular might raise further questions regarding the obligations of global companies like Google and the other Big Five information technology companies. What if it were to read “governments and militaries in many other areas”? What does work either with one nation’s military, or many, imply for Google’s commitment to users and customers around the world? We believe these principles are the right foundation for our company and the future development of AI. This approach is consistent with the values laid out in our original Founders’ Letter back in 2004. There we made clear our intention to take a long-term perspective, even if it means making short-term tradeoffs. We said it then, and we believe it now. This passage is presumably responsive to media reports of changes to Google’s Code of Conduct, from “Don’t Be Evil” (highly lauded but actually setting quite a low bar), to Alphabet’s “Do the Right Thing.” This familiar injunction is also a famously vacuous one, in the absence of the requisite bodies for deliberation, appeal, and redress. The overriding question for all of these principles, in the end, concerns the processes through which their meaning and adherence to them will be adjudicated. It’s here that Google’s own status as a private corporation, but one now a giant operating in the context of wider economic and political orders, needs to be brought forward from the subtext and subject to more explicit debate. While Google can rightfully claim some leadership among the Big Five in being explicit about its guiding principles and areas that it will not pursue, this is only because the standards are so abysmally low. We should demand a lot more from companies as large as Google, which control such disproportionate amounts of the world’s wealth, and yet operate largely outside the realm of democratic or public accountability. Having completed my domestic labors for the day (including a turn around the house with my lovely red Miele), I take a moment to consider the most recent development from Boston Dynamics (now part of the robotics initiative at sea in Google’s Alphabet soup). 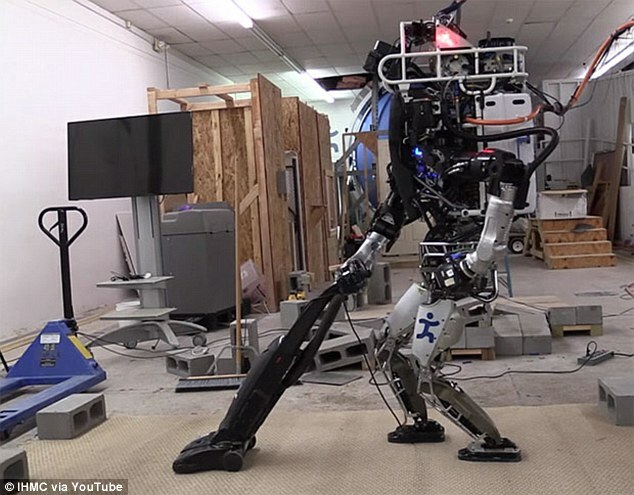 More specifically, the news is of the latest incarnation of Boston Dynamic’s bipedal robot, nicknamed Atlas and famous for its distribution as a platform for DARPA’s Robotics Challenges. Previously figured as life-saving first responder and life-destroying robot soldier, Atlas is now being repositioned – tongue firmly in cheek – as a member of the domestic workforce. While irony operates effectively to distance its author from serious investment in truth claims or moral positioning, irony also generally offers a glimpse into its stance towards its objects. So at the risk of humorlessness, it’s worth reading this latest rendering of Atlas’ promises seriously, in the context of other recent developments in humanoid robotics. I wrote in a former post about the U.S. military’s abandonment of Boston Dynamic’s Big Dog and its kin, attributed by commentators to some combination of disappointment in the robot’s performance in the field, and a move toward disinvestment in military applications on the part of Google’s ‘Replicant’ initiative (recently restructured as the ‘X’ group). This leaves a robot solution in search of its problem, and where better to turn than to the last stronghold against automation; that is, the home. Along with the work of care (another favourite for robotics prognosticators), domestic labor (the wonders of dish and clotheswashing machines notwithstanding) has proven remarkably resistant to automation (remarkable at least to roboticists, if not to those of us well versed in this work’s practical contingencies). In a piece headlined ‘Multimillion dollar humanoid robot doesn’t make for a good cleaner,’ the Guardian reproduces a video clip (produced in fast motion with upbeat technomusic soundtrack) showing Florida’s Institute for Human and Machine Cognition (IHMC), runner up in the 2015 Robotics Challenge, testing new code ‘by getting the multimillion dollar Atlas robot to do household chores.’ In an interesting inversion, the robot is described as the ‘Google-developed US government Atlas robot,’ a formulation which sounds as though the development path went from industry to the public sector, rather than the other way around. Housework, we’re told, proves ‘more difficult than you might imagine,’ suggesting that the reader imagined by the Guardian is one unfamiliar with the actual exigencies of domestic work (while for other readers those difficulties are easily imaginable). The challenge of housework is revealing of the conditions required for effective automation, and their absence in particular forms of labor. Specifically, robots work well just to the extent that their environments – basically the stimuli that they have to process, and the conditions for an appropriate response – can be engineered to fit their capacities. The factory assembly line has, in this respect, been made into the robot’s home. Domestic spaces, in contrast, and the practicalities of work within them (not least the work of care) are characterized by a level of contingency that has so far flummoxed attempts at automation beyond the kinds of appliances that can either depend on human peripherals to set up their conditions of operation (think loading the dishwasher), or can operate successfully through repetitive, random motion (think Roomba and its clones). Long underestimated in the value chain of labor, robotics for domestic work might just teach us some lessons about the extraordinary complexity of even the most ordinary human activities. Missing between the lines of the reports from and around Davos are the persistent gaps between the rhetoric of AI and robotics, and the realities. These gaps mean that the progress of automation will be more one of degradation of labor than its replication, so that those who lose their jobs will be accompanied by those forced to adjust to the limits and rigidities of automated service provision. The threat, in other words, is not that any job can be automated, as the gurus assert, but rather that in a political economy based on maximizing profitability for the few, more and more jobs will be transformed into jobs that can be automated, regardless of what is lost. Let us hope that in this economy, low and no wage jobs, like care provision and housework, might show a path to resistance. hu·brisˈ(h)yo͞obrəs/noun: hubris 1.	excessive pride or self-confidence. The new year opens with an old story, as The Independent headlines that Facebook multibillionaire Mark Zuckerberg (perhaps finding himself in a crisis of work/life balance) will “build [a] robot butler to look after his child” [sic: those of us who watch Downton Abbey know that childcare is not included in the self-respecting butler’s job description; even the account of divisions of labour among the servants is garbled here], elaborating that “The Facebook founder and CEO’s resolution for 2016 is to build an artificially intelligent system that will be able to control his house, watch over his child and help him to run Facebook.” To put this year’s resolution into perspective, we learn (too much information) that “Mr. Zuckerberg has in the past taken on ‘personal challenges’ that have included reading two books per month, learning Mandarin and meeting a new person each day.” “Every challenge has a theme,” Zuckerberg explains, “and this year’s theme is invention” (a word that, as we know, has many meanings). We’re reminded that FB has already made substantial investments in AI in areas such as automatic image analysis, though we learn little about the relations (and differences) between those technologies and the project of humanoid robotics. I’m reassured to hear that Zuckerberg has said “that he would start by looking into existing technologies,” and hope that might include signing up to be a follower of this blog. But as the story proceeds, it appears in any case that the technologies that Z has in mind are less humanoid robots, than the so-called Internet of things (i.e. networked devices, presumably including babycams) and data visualization (for his day job). This is of course all much more mundane and so, in the eyes of The Independent’s headline writers, less newsworthy. The title of this post is of course the most obvious conclusion to draw regarding the case of Mark Zuckerberg; in its modern form, ‘hubris’ refers to an arrogant individual who believes himself capable of anything. And surely in a political economy where excessive wealth enables disproportionate command of other resources, Zuckerberg’s self-confidence is not entirely unwarranted. In this case, however, Zuckerberg’s power is further endowed by non-investigative journalism, which fails to engage in any critical interrogation of his announcement. Rather than questioning Zuckerberg’s resolution for 2016 on the grounds of its shaky technical feasibility or dubious politics (trivializing the labours of service and ignoring their problematic histories), the Independent makes a jump cut to the old saws of Stephen Hawking, Elon Musk and Ex Machina. Of course The Independent wouldn’t be the first to notice the film’s obvious citation of Facebook and its founder and CEO (however well the latter is disguised by the hyper-masculine and morally degenerate figure of Nathan). But the comparison, I think, ends there and of course, however fabulous, neither Zuckerberg nor Facebook are fictional. The original Greek connotations of the term ‘hubris’ referenced not just overweening pride, but more violent acts of humiliation and degradation, offensive to the gods. While Zuckerberg’s pride is certainly more mundane, his ambitions join with those of his fellow multibillionaires in their distorting effects on the worlds in which their wealth is deployed (see Democracy Now for the case of Zuckerberg’s interventions into education). And it might be helpful to be reminded that in Greek tragedy excessive pride towards or defiance of the gods lead to nemesis. The gods may play a smaller role in the fate of Mark Zuckerberg, however, and the appropriate response I think is less retributive than redistributive justice. 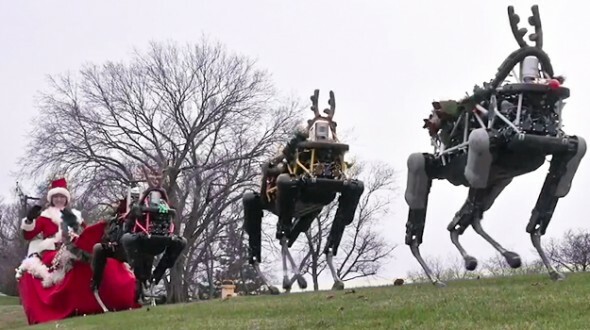 A pack of international news outlets over the past few days have reported the abandonment by the US Department of Defence of Boston Dynamic’s Legged Squad Support System or LS3 (aka ‘Big Dog’) and its offspring (see Don’t kick the Dog). After five years and USD $42 million in investment, what was promised to be a best in breed warfighting companion stumbled over a mundane but apparently intractable problem – noise. Powered by a gas (petrol) motor likened to a lawnmower in sound, the robot’s capacity for carrying heavy loads (400 lbs or 181.4kg), and its much celebrated ability to navigate rough terrain and right itself after falling (or be easily assisted in doing so), in the end were not enough to make up for the fact that, in the assessment of the US Marines who tested the robot, the LS3 was simply ‘too loud’ (BBC News 30 January 2015). The trial’s inescapable conclusion was that the noise would reveal a unit’s presence and position, bringing more danger than aid to the U.S. warfighters that it was deployed to support. A second concern contributing to the DoD’s decision was the question of the machine’s maintenance and repair. Long ignored in narratives about technological progress, the place of essential practices of inventive maintenance and repair has recently become a central topic in social studies of science and technology (see Steven J. Jackson, “Rethinking Repair,” in Tarleton Gillespie, Pablo Boczkowski, and Kirsten Foot, eds. Media Technologies: Essays on Communication, Materiality and Society. MIT Press: Cambridge MA, 2014.). These studies are part of a wider project of recognizing the myriad forms of invisible labour that are essential conditions for keeping machines working – one of the enduring continuities in the history of technology. 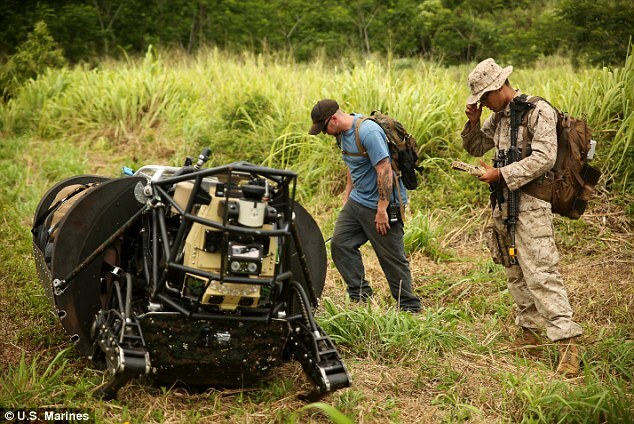 The LS3 trials were run by the Marine’s Warfighting Lab, most recently at Kahuku Training Area in Hawaii during the Rim of the Pacific exercise in July of 2014. Kyle Olson, spokesperson for the Lab, reported that seeing the robot’s potential was challenging “because of the limitations of the robot itself.” This phrasing is noteworthy, as the robot itself – the actual material technology – interrupts the progressive elaboration of the promise that keeps investment in place. According to the Guardian report (30 December 2015) both ‘Big Dog’ and ‘Spot,’ an electrically powered and therefore quieter but significantly smaller prototype, are now in storage, with no future experiments planned. had a broad vision of creating general-purpose bots that could cook, take care of the elderly, or build other machines, but the actual specifics of Replicant’s efforts were all entrusted to Rubin. Rubin has said that Page gave him a free hand to run the robotics effort as he wanted, and the company spent an estimated $50 million to $90 million on eight wide-ranging acquisitions before the end of 2013. Resistance, it seems, is not entirely futile. Alerted that BBC News/Technology has developed a story titled ‘Intelligent Machines: The Truth Behind AI Fiction’, I follow the link with some hopeful anticipation. The piece opens: ‘Over the next week, the BBC will be looking into all aspects of artificial intelligence – from how to build a thinking machine, to the ethics of doing so, to questions about whether an AI can ever be creative.’ But as I read on my state changes to one that my English friends would characterize as gobsmacked. Instead of in-depth, critical journalism this piece reads like a (somewhat patronizing) children’s primer with corporate sponsorship. We’re told, for example, that Watson, IBM’s supercomputer ‘can understand natural language and read millions of documents in seconds’. But if it’s a deeper understanding of the state of the art in AI that we’re after, we can’t let terms like ‘understand’ and ‘read’ go by unremarked. Rather, it’s precisely the translation of computational processes as ‘understanding’ or ‘reading’, and the difference lost in that translation from our understanding and reading of those terms, that needs to be illuminated. 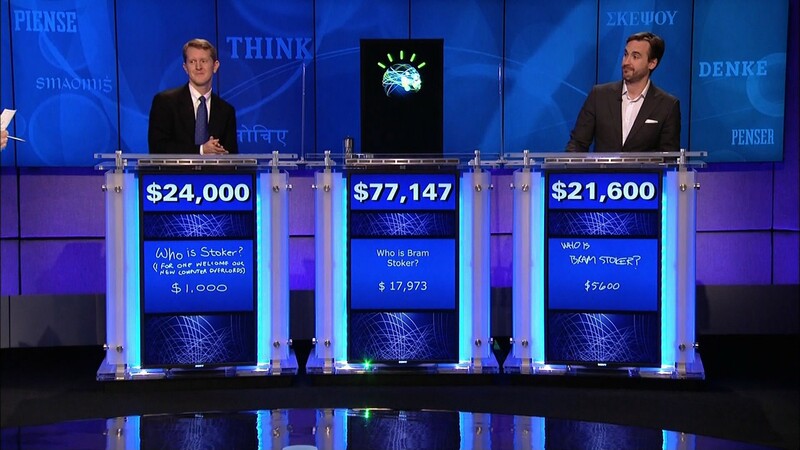 We might then fully appreciate the ingenious programming that enables the system singularized as ‘Watson’ to compete successfully on the televised quiz show Jeopardy, despite the machine’s cluelessness regarding the cultural references that its algorithms and databases encode. Things go from bad to worse, however, when we’re told that Watson ‘is currently working in harmony with humans, in diverse fields such as the research and development departments of big companies such as Proctor and Gamble and Coca-Cola – helping them find new products’. Why equate harmonious working relations with the deployment of an IBM supercomputer in the service of corporate R&D? And what kinds of ongoing labours of code development and maintenance are required to reconfigure a cluster of ninety IBM Power 750 servers, each of which uses a 3.5 GHz POWER7 eight core processor in such a way that it can operate usefully within these enterprises? The anthropomorphism of Watson obfuscates, rather than explicates, these ‘truths’ about artificial intelligence and its agencies. In the absence of any indication that this story is part of a paid advertisement, I’m at a loss to explain how it achieved the status of investigative journalism within the context of a news source like the BBC. If this is what counts as thoughtful reporting, the prospects for AI-based replication are promising indeed. 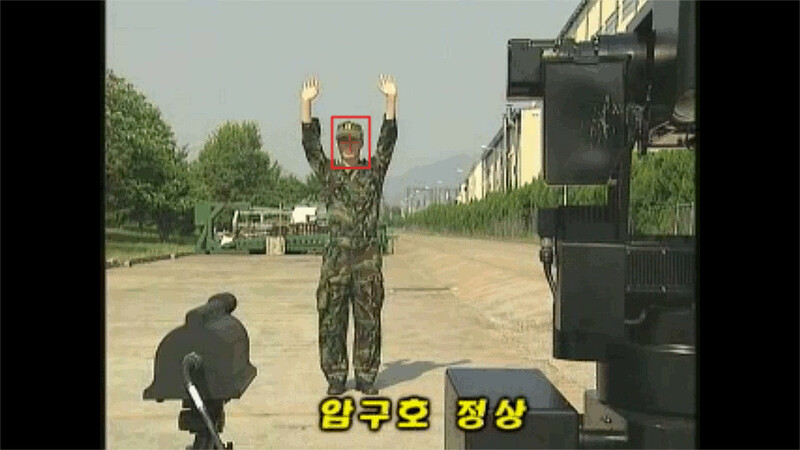 Screencap of South Korean autonomous weapon in action courtesy of Richard Anders via YouTube. Reticle added by Curiousmatic. Amidst endless screen shots from Terminator 3: Rise of the Machines (Warner Bros Pictures, 2003), and seemingly obligatory invocations of Stephen Hawking, Elon Musk and Steve Wozniak as signatories, the media reported the release on 28 July of an open letter signed by thousands of robotics and AI researchers calling for a ban on lethal autonomous weapons. The letter’s release to the press was timed to coincide with the opening of the International Joint Conference on Artificial Intelligence (IJCAI 2015) in Buenos Aires. Far more significant than the inclusion of celebrity signatories – their stunning effect in drawing international media attention notwithstanding – is the number of prominent computer scientists (not a group prone to add their names to political calls to action) who have been moved to endorse the letter. Consistent with this combination of noise and signal, the commentaries generated by the occasion of the letter’s release range from aggravatingly misleading to helpfully illuminating. The former category is well represented in an interview by Fox News’ Shepard Smith with theoretical physicist and media scientist Michio Kaku. In response to Smith’s opening question regarding whether or not concerns about autonomous weapons are overblown, Kaku suggests that “Hollywood has us brainwashed” into thinking that Terminator-style robots are just around the corner. Quite the contrary, he assures us, “we have a long ways to go before we have sentient robots on the battlefield.” This ‘long ways to go’ is typical of futurist hedges that, while seemingly interrupting narratives of the imminent rise of the machines, implicitly endorse the assumption of continuing progress in that direction. Kaku then further affirms the possibility, if not inevitability, of the humanoid weapon: “Now, the bad news of course is that once we do have such robots, these autonomous killing machines could be a game changer.” Having effectively clarified that his complaint with Hollywood is less the figure of the Terminator-style robot than its timeline, he reassures us that “the good news is, they’re decades away. We have plenty of time to deal with this threat.” “Decades away, for sure?” asks Shepard Smith. “Not for sure, cuz we don’t know how progress is,” Kaku replies, and then offers what could be a more fundamental critique of the sentient robot project. Citing the disappointments of the recent DARPA Robotics Challenge as evidence, he explains: “It turns out that our brain is not really a digital computer.” The lesson to take from this, he proposes, is that the autonomous killing machine “is a long term threat, it’s a threat that we have time to digest and deal with, rather than running to the hills like a headless chicken” (at which he and Shepard share a laugh). While I applaud Kaku’s scepticism regarding advances in humanoid robots, it’s puzzling that he himself frames the question in these terms, suggesting that it’s the prospect of humanoid killer robots to which the open letter is addressed, and (at least implicitly) dismissing its signatories as the progeny of Chicken Little. Having by now spent all but 30 seconds of his 3 minutes and 44, Kaku then points out that “one day we may have a drone that can seek out human targets and just kill them indiscriminately. That could be a danger, a drone that’s only mission is to kill anything that resembles a human form … so that is potentially a problem – it doesn’t require that much artificial intelligence for a robot to simply identify a human form, and zap it.” Setting aside the hyperbolic reference to indiscriminate targeting of any human form (though see the Super Aegis 2 system projected to patrol the heavily armed ‘demilitarized zone’ between North and South Korea), this final sentence (after which the interview concludes) begins to acknowledge the actual concerns behind the urgency of the campaign for a ban on lethal autonomous weapons. Those turn not on the prospect of a Terminator-style humanoid or ‘sentient’ bot, but on the much more mundane progression of increasing automation in military weapon systems: in this case, automation of the identification of particular categories of humans (those in a designated area, or who fit a specified and machine-readable profile) as legitimate targets for killing. In fact, it’s only the popular media that have raised the prospect of fully intelligent humanoid robots: the letter, and the wider campaign for a ban on lethal autonomous weapons, has nothing to do with ‘Terminator-style’ robots. The developments that are cited in the letter are both far more specific, and more imminent. That specificity is clarified in a CNET story about the open letter produced by Luke Westaway, broadcast on July 27th. Despite its inclusion of cuts from Terminator 3 and its invocation of the celebrity triad, we’re also informed that the open letter defines autonomous weapons as those that “select and engage targets without human intervention.” The story features interviews with ICRAC’s Noel Sharkey, and Thomas Nash of the UK NGO Article 36. Sharkey helpfully points out that rather than assuming humanoid form, lethal autonomous weapons are much more likely to look like already-existing weapons systems, including tanks, battle ships and jet fighters. He explains that the core issue for the campaign is an international ban that would pre-empt the delegation of ‘decisions’ to kill to machines. It’s worth noting that the word ‘decision’ in this context needs to be read without the connotations of that term that associate it with human deliberation. A crucial issue here – and one that could be much more systematically highlighted in my view – is that this delegation of ‘the decision to kill’ presupposes the specification, in a computationally tractable way, of algorithms for the discriminatory identification of a legitimate target. The latter, under the Rules of Engagement, International Humanitarian Law and the Geneva Conventions, is an opponent that is engaged in combat and poses an ‘imminent threat’. We have ample evidence for the increasing uncertainties involved in differentiating combatants from non-combatants under contemporary conditions of war fighting (even apart from crucial contests over the legitimacy of targeting protocols). The premise that legitimate target identification could be rendered sufficiently unambiguous to be automated reliably is at this point unfounded (apart from certain nonhuman targets like incoming missiles with very specific ‘signatures’, which also clearly pose an imminent threat). ‘Do we want to live in a world in which we have given machines the power to take human lives, without a human being there to pull the trigger?’ asks Thomas Nash of Article 36 (CNET 27 July 2015)? Of course the individual human with their hand on the trigger is effectively dis-integrated – or better highly distributed – in the case of advanced weapon systems. But the existing regulatory apparatus that comprises the laws of war relies fundamentally on the possibility of assigning moral and legal responsibility. However partial and fragile its reach, this regime is our best current hope for articulating limits on killing. The precedent for a ban on lethal autonomous weapons lies in the United Nations Convention on Certain Conventional Weapons (CCW), the body created ‘to ban or restrict the use of specific types of weapons that are considered to cause unnecessary or unjustifiable suffering to combatants or to affect civilians indiscriminately.’ Achieving that kind of legally binding international agreement, as Westaway points out, is a huge task but as Thomas Nash explains there is some progress. 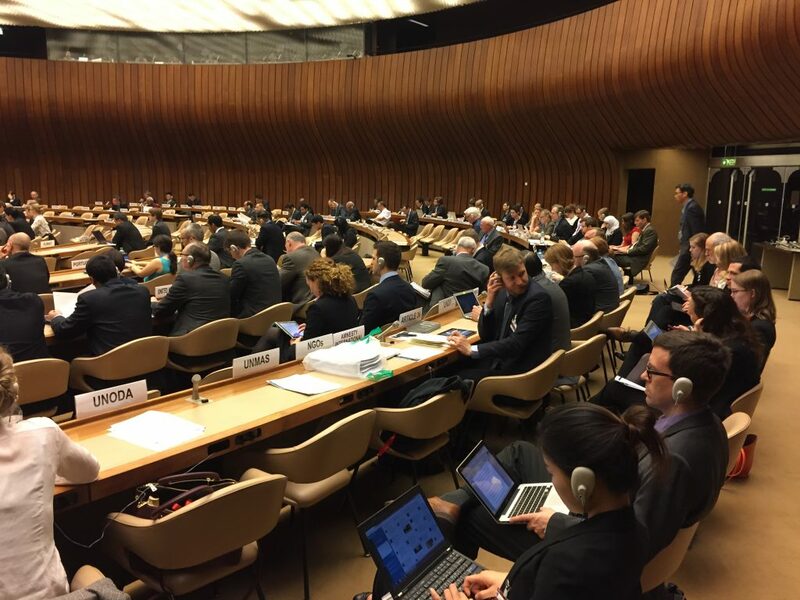 Since the launch of the campaign in 2013, the CCW has put the debate on lethal autonomous weapons onto its agenda and held two international ‘expert’ consultations. 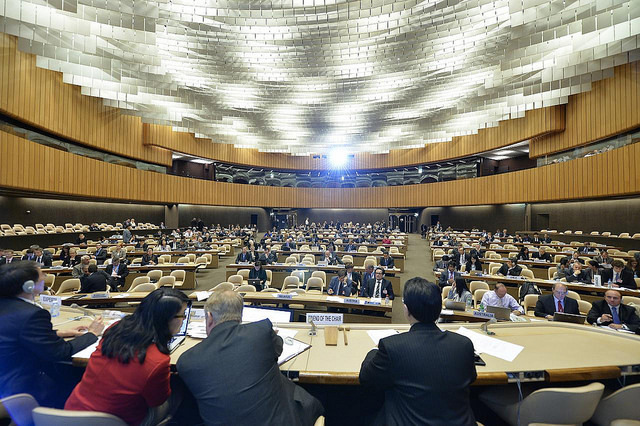 At the end of this year, the CCW will consider whether to continue discussions, or to move forwards on the negotiation of an international treaty. To appreciate the urgency of interventions into the development of lethal autonomous weapons, science and technology studies (STS) offers a useful concept. The idea of ‘irreversibility’ points to the observation that, while technological trajectories are never self-determining or inevitable, the difficulties of undoing technological projects increase over time. (See for example Callon, Michel (1990), Techno-economic networks and irreversibility. The Sociological Review, 38: 132–161) Investments (both financial and political) increase as does the iterative installation and institutionalization of associated infrastructures (both material and social). The investments required to dismantle established systems grow commensurately. In the CNET interview, Nash points to the entrenched and expanding infrastructures of drone technology as a case in point. BBC World News (after invoking the Big Three, and also offering the obligatory reference to The Terminator) interviews Professor Heather Roff who helped to draft the letter. The BBC’s Dominic Laurie asks Roff to clarify the difference between a remotely-operated drone, and the class of weapons to which the letter is addressed. Roff points to the fact that the targets for current drone operations are ‘vetted and checked’, in the case of the US military by a Judge Advocate General (JAG). She is quick to add, “Now, whether or not that was an appropriate target or that there are friendly fire issues or there are collateral killings is a completely different matter”; what matters for a ban on lethal autonomous weapons, she emphasizes, is that “there is a human being actually making that decision, and there is a locus of responsibility and accountability that we can place on that human.” In the case of lethal autonomous weapons, she argues, human control is lacking “in any meaningful sense”. While those of us engaged in thinking through STS are preoccupied with the contingent and shifting distributions of agency that comprise complex sociotechnical systems, the hope for calling central actors to account rests on the possibility of articulating relevant legal and normative frameworks. These two approaches are not, in my view, incommensurable. Jutta Weber and I have recently attempted to set out a conception of human-machine autonomies that recognizes the inseparability of human and machine agencies, and the always contingent nature of ideas of autonomy, in a way that supports the campaign against lethal autonomous weapons. Like the signatories to the open letter, and as part of a broader concern to interrupt the intensification of automated killing, we write of the urgent need to reinstate human deliberation at the heart of matters of life and death. A series of recent media reports on robotic futures have provoked a post. I’ll begin with the latest announcements of the imminent arrival of the perfect domestic robot friend/pet/servant, this time in the form of Jibo the ‘family robot’. The crowdfunding appeal via IndieGogo features a promotional video headlined by CEO of Jibo, Inc. Cynthia Breazeal, faculty member in MIT’s Media Lab. 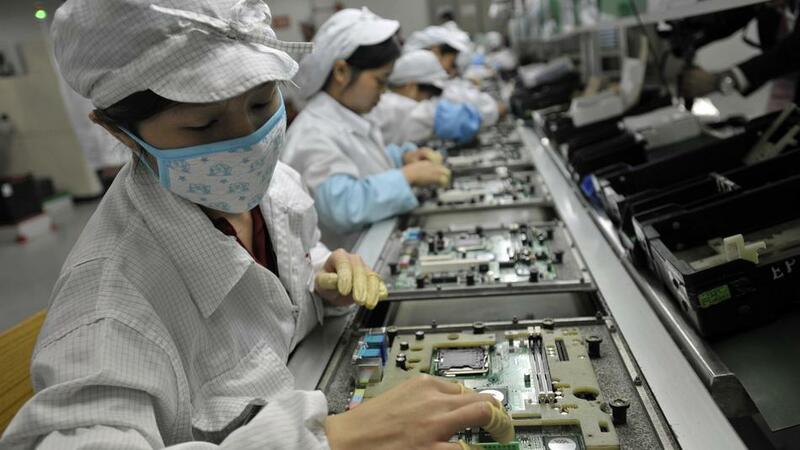 As promotion morphs into mobilization, and consumerism into a call for collective action, we might turn to a second story from The China Post published several days earlier, titled ‘Foxconn to increase robot usage to curb workers’ suicide rates’ (Lan Lan and Li Jun, Asia News Network, July 14, 2014). From this story we learn that “Foxconn Technology Group plans to use more robots in its various manufacturing operations as part of its efforts to replace ‘dangerous, boring and repeated’ work, which has often been blamed for the series of suicides at its various facilities in recent years.” While the embedded quote is not attributed, it cites the oft-repeated triple of ‘dangerous, dull, and dirty’ that characterizes those forms of labour considered a priority for automation. Assumed to be jobs that no human would want, this valuation makes absent the fact that these are the only jobs that, worldwide, increasing numbers of people rely upon to survive. The article goes on to describe the new industrial park in Guiyang being custom designed for Foxconn’s automated production lines, in which energy saving and environmental protection will be prioritized to meet the preference of customers like Apple for more environmentally friendly manufacturing. The greatest problem is that such artificial intelligence may be indifferent to human welfare. Thus, for instance, unless otherwise programmed, it could solve problems in ways that could lead to harm against humans. But indifference, rather than innate malevolence, is much more easily cured. Artificial intelligence can be programmed to weigh human values in its decision making. The key will be to assure such programming. In the context of these earlier stories, concerns about the possibility that future humanlike machines might be indifferent to human welfare can’t help but beg the question of contemporary humans’ seeming indifference to the welfare of other humans. As long as representations of the human family like those of Jibo’s promotion continue to universalize the privileged forms of life that they depict, they effectively erase the unequal global divisions of labour and livelihood on which the production of ‘our things’ currently depends. As long as news of Foxconn celebrates the company’s turn to environmentally friendly manufacturing while failing to acknowledge the desperate labour conditions that drive Foxconn workers first to take the dangerous, boring, and repetitive work on offer in the manufacture of Apple products, then drives many of them to suicide, and now threatens to render their lives more desperate with the loss of even those jobs, the problem of just what our shared ‘human values’ are remains. And before we take seriously the question of what it would mean for our technology to treat us as human beings, we might ask what it would mean for us to treat other humans as human beings, including the commitments to social justice that would entail. Postscript: For a small bit of good news we might turn to one more story that appears this week. Reporter Martyn Williams writes today in PC World that since its purchase by Google, robot company Boston Dynamics’ funding from the US Defense Department has dropped from the $30 million/year range of the past several years, to just $1.1 million for 2014 (the latter for participation in DARPA’s robotics challenge). Our relief might be mitigated by speculation that Google will focus its own robotics efforts on factory automation and ‘home help’, but this small movement away from militarism is a welcome one nonetheless.